Trusted Reviews has teste a color LED printer from OKI. 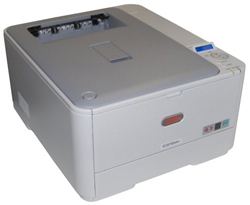 The OKI printer is called OKI C310dn and is able to print up to 24 pages per minute or so OKI claims on their webpages. Let us hear what the reviewer over at Trusted Reviews has to say about this LED printer. Trusted Reviews ends up giving the OKI C310dn an overall score of 7 out of 10 possible points. The printer scores highest on print quality while it scores a bit lower on print speeds, value for your money and features. The print quality is pretty good and the running costs are not very high, but the print speed could be a bit better so if you are looking for a printer for a busy work place there might be better choices out there. Read the full review of the OKI C310dn LED printer here.